Insulated with light, warm, recycled Ecopet insulation, the Ignite 20 is a true three-season performer ready for any overnight adventure. A full-length zip vents extra heat on warmer nights while four sizes including a women's specific model make it easy to find a bag with a perfect fit. The Ignite XP 20 will keep you warm with lots of key features. 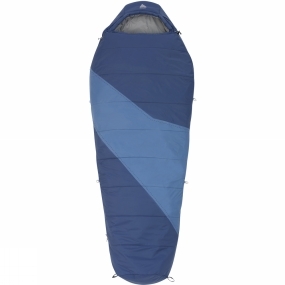 The layered, offset, quilt construction with ground-level side seams and differential cut maximizes warmth and eliminates cold spots while the top draft collar and zip draft tube with anti-snag design will keep the cold air out of the bag. The efficient, form fitting hood is warm and comfortable and the Fatman and Ribbon draw cords, with captured cord lock for one-handed adjustment, makes it easy to adjust. The bag is also easy to get in and out of with the Dual-slider locking zip. Also includes internal liner loops, sleeping pad security loops to keep you on your pad (straps sold separately), hanging loops, and a stuff sack.